MARIJUANA SEEDS >>> If you can not get a clone of a plant you admire and want to grow then the very next best thing is getting the right genetics by buy a brand name seed from breeders like GreenHouse, DNA genetics, Barneys or Royal Queen for example. They have been keeping the strain steady and offer a pure strain to grow just as you would from a clone. 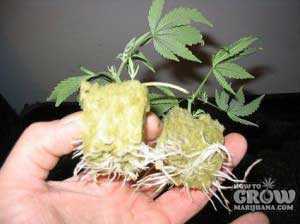 These may be purchased online or from most any hydroponic shop or built yourself (DIY). Essentially it requires a waterproof tub or bucket, PVC plumbing, a water pump and neoprene collars or net pots to hold your cuttings, an air pump and possibly a timer. If you are doing more than four marijuana clones at a time, this may well be the way to go for you. Taste/Aroma – You will not have been able to sample your produce yet but the aroma they are beginning to give off gives a good indication of the quality of the final product. This is of particular importance if you are growing good tasty strains like Blueberry or EXODUS CHEESE.